Sorry - Due to new Google Maps Quota Limits, maps may not be working properly. The maps "sortof" work - click on the OK button in any map and you can still view it, but its not in full color and fully functional. The California Christmas Lights (CCL) website is the largest and most comprehensive collection of the best and brightest Christmas light and yard displays from all of California: San Francisco Bay Area, Central Valley, Sacramento, Los Angeles and San Diego. Lights of the Valley (LOTV) is NOW California Christmas Lights (CCL)! Now with 339 Houses (339 confirmed for 2018), in 124 Cities, in 37 Counties. 2018 was our 20th year of showing you the best Christmas displays in California. 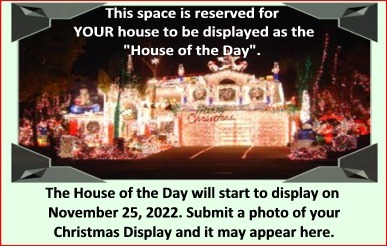 NOTE: The California Christmas Lights site always "Closes" on New Years Day. The site will "Open" again on the Friday After Thanksgiving Day! Check out our Daily Stats - Read the Latest News and Updates to CCL! December 1, 2017: The website broke the 3 million user mark today. NOVA TV, a European TV network, broadcast this video across 8 countries in Europe about Alex Dourov and CCL on December 24, 2009. This version of the video does NOT have a narration, but download this PDF FIRST, which contains the narration as translated into English (from Croatian). KKIQ has supported this website for TWENTY YEARS - thank you to all the media outlets for your continued support year after year. Without the generosity of this technology provider, this site would not be as useful and usable as it is. I am truly grateful for their investments in helping me bring this community service site to you. InfoQuest Technologies, a leading provider of web hosting and other hosted Internet Business Solutions, has provided California Christmas Lights with "advanced" web hosting for TWENTY YEARS.